My first trip to New Orleans defined traveling for me in the same way that the city of New Orleans would define destinations for me; traveling is for seeing things. Arriving is for being things. The trip? Imagine seeing your home stretch and erode away from the vantage of the car you are in every day, not by the elevation of a charter bus like every time before; sleeping in the car long enough to wake up in Mississippi, where the accents became more “foreign” than “Southern”, and where the local regulars at the McDonald’s speak kindly to the gentleman at the first table in the restaurant who is suffering wildly and vocally from Tourette’s; stopping for gas in Transylvania, MS, where all the land in each direction is used for peppers and soybeans, save for a gas station and an old, whitewashed school/church building here and there(on a subsequent trip, the old mad at the same gas station would tell me that infants, miscarried by migrant workers working in the summer heat, are buried next to the peppers right on the spot); driving through run-down bad side of Vicksburg to find the most beautiful Civil War memorial in the country in the rolling hills; driving across Lake Ponchartrain, which is similar to driving to the Florida Keys. In summary: each trip you take should be full of little moments, an amuse-bouche or two, to get you ready for the main attraction. Not everyone understands or appreciates the way I feel about traveling, or the unique vibe that New Orleans has to offer. On trips I would make with the university, with peers old enough to understand, it became all too apparent. They were bored. “I can’t believe that there’s nothing to do here,” they would say. They wanted to drink or gamble to “create” a happening, like the tourist-y revelers on Bourbon Street are wont to do. A few curious people hung out with me just to see what I did, and all but a couple left when I was really doing. . . nothing. Drinking coffee. Chatting up the waitress at Fiorella’s while it took them an hour to make me an oyster po boy, and not making a fuss about the time it took. I bought a glass-bottle cream soda at the little grocery next door and haggled in the market over the price of some neckties; that took two hours. Even though we had flown, I still felt the weight of the destination while most of my companions were still trying to take a trip out on the dirty wet streets. Too bad for them. My feelings about enjoying the destination? Queen Ida, and the whole of zydeco music, pretty well asks you to do the same thing. It is safe to say that Queen Ida is a standout in the world of zydeco. 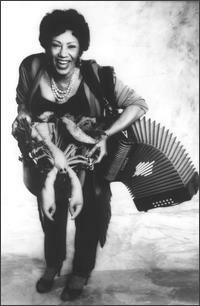 Many credit her as the first female leader of a zydeco band and one of a few female zydeco accordion players. Her style is unusually treble heavy for Creole music, something she probably picked up from living in Texas for eight years, where the influence of Banda music’s high-treble accordion parts sunk into her piano-playing mind. Her obvious talent, coupled with the gender empowerment of her position, has made her a statesmen for zydeco music. Literally a statesmen: after her tour of Japan, the first zydeco performer of any gender to do so, the US State Department sent her on a tour of Africa, with tours to New Zealand and Australia to follow. She’s played on the Monterey Jazz Festival. She’s played on Saturday Night Live. What more do you want from a zydeco musician? No really: what more do you want? I ask, because lots of people find zydeco and Cajun music “boring”. It’s easy to do; it falls in the “it all sounds the same” camp for people who aren’t fans, like “dance” or “electronic” or “hip-hop” does for many others. Technically, as far as musicianship goes, nothing is going to blow you away(somehow zydeco has escaped the “hillbilly-with-astounding-technique-and-talent” mythos that is suffered by the perception of folk and bluegrass, an entire other essay that could really be a book). Similar tempos, similar structures, similar timbres. . . boring in description. Zydeco was never about being a rock star or a virtuoso, though. Playing the accordion and singing in a Cajun band isn’t about climbing the ladder of musical success. It isn’t about going anywhere; it’s about being there already. Not only did Queen Ida remain grounded in her life(she drove a bus part time, went to nursing school, and raised a family all while gaining notoriety as the leader of the band), she lived in the parts of the world that nurtured the same attitudes that I felt while traveling: Born in Lake Charles, Louisiana, just a stretch west on I-10 from New Orleans and lived her adult life in San Francisco, California. 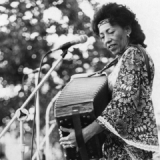 To think that there was enough of a demand for her to play zydeco music in San Francisco that it helped her rise to music statesmen status is not only a testament to her musicianship, but a testament to the underlying attitudes of two great American cities. 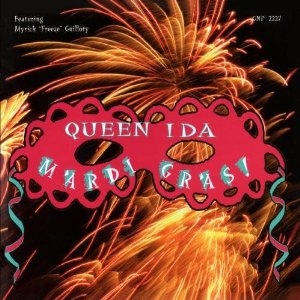 Mardi Gras is a later Queen Ida album with a studio feel rather than the usual live recorded albums. This studio work takes a little of the edge off the “live” moments that spice up zydeco music typically(call outs, stomps and claps, extra vamps), but, other than a pesky bit of saxophone, you still get all that you might want from a zydeco album, plus a full understanding of what Queen Ida brings to the table: plenty of French, her native language, a great feel for how the frills and trills of the accordion ornament the music but back off when needed, and sufficient blues and rock moments to make a jambalaya out of the whole thing. Why this album and not one of the others? Because my partner gave me this one. I asked him, “Hey, give me an album that I haven’t heard from your cd folder,” and this is the one he pulled. Do I dare read too much into his decision? If you’ve read this blog, you know that’s a dare I always take when it comes to any decision involving music. But, regardless, the parallels are there; we’ve been together eleven years now. I can’t tell you the exact moment we stopped traveling, but we are there now. Being there together. Any other trip would make me feel homesick. He’s talked about heading into Louisiana to find where some relatives are buried there. It’s not hard imagining going with him, through the flats and pepper fields, through the live oak swamplands, stopping at a hole-in-the-wall restaurant here and there, Queen Ida settling into a casual off-beat rhythm on the stereo, on the way outside Lake Charles, both enjoying the trip and loving having nowhere else to go. Of all of the trips I took as a student at the U of A, three stand out: San Francisco, Chattanooga, and Savannah, GA. Places that I got to “be there” with you, Kent. Great times with even better stories that I can still share with the people that enter my life at various times.